Set up in 2015, SecurityWomen is an advocacy organisation for the inclusion of more women in security sector institutions, including the military and police, in countries throughout the world. There exist multiple threats to human security which have the potential to reduce, or stifle an increase, in human well-being, not least political and/or economic in nature, which can develop into full-scale conflict. Human induced threats which affect well-being range from localised crime to organised conflict to widespread terrorism. The vital area of security of human existence cannot be run along gender segregation lines. Women should be equal partners in the protection and security of citizens in all areas, as well as being proactive participants in matters of conflict resolution and peace-building. SecurityWomen seeks to provide information from a wide variety of sources on the position of women in the security sector. Through academic research, media stories, UN reports and civil society policies, the intention is to bring to public awareness the progress of gender equality. To conduct an examination of the barriers to women’s progress, from how to attract more women to join the military and police, to how to develop a professional working environment free from gender discrimination, and in which women seek to remain employed. To highlight learning and development practices within the security sector and the use of gender-sensitive training for all. To gather information on women’s role in peacekeeping, and their position in conflict negotiations and efforts in peacebuilding. To seek to evaluate women’s contribution and progress towards equality of representation within UN peacekeeping forces. Gender responsive peace and security provisioning is becoming an internationally recognised imperative. There can be no development, sustainable or otherwise, when conflict occurs, and women have a major role in contributing to the prevention of conflict, and to peace-building and peacekeeping. The goals to eradicate poverty and prevent environmental degradation need to encompass progress towards a more peaceful world in which gender equality is an essential component. The World Economic Forum stated in January 2015 that the risk of international conflict is a major threat facing countries and businesses in the coming decade, more so than global economic considerations. There are fears over major clashes between states and point to the fact that the nature of conflict, and the means to wage it, have been rapidly changing. Advances in technology development mean the arrival of warfare methods such as drone strikes and cross-border cyber attacks. The significance to be grasped is that any nation state is in constant risk of being implicated in some element of violence in an increasingly interconnected and mobile world. With the provision of defence forces, deployed often for essentially security purposes, the necessity for human physicality and strength is less important. The arguments for the exclusion of women in the military, supposedly because of inferior physical and emotional strength, are irrelevant if not baseless. The military as an institution is seen as a bastion of maleness: ‘it projects, reinforces and is shaped by patriarchy’ (Hendricks 2013). Furthermore, ‘the transformation of gender relations within the defence force requires a shift away from an ideology of militarism’ (ibid). A change in the dynamics of defence institutions, including the military and police, can be brought about by the greater participation of women, in particular in decision-making positions. Historically, and often currently, militarism promotes the use of physical violence for resolving conflict, operates on the dualistic basis of foe/friend, and entrenches hierarchical power relations and normative notions of masculinity and femininity (Hendricks 2013). Women are essentialised as needing protection and are often seen as victims. The fact that militarism is inevitably conceptualised as masculine, points to a need to reframe our understanding of what militarism in the twenty-first century is about. First and foremost, there is a need to ensure human security. Regarding the reference above to the changing nature of conflict, we live in an inter-connected world where there will always exist a number of people who are intent on violence whether on a small-scale local level or on an international scale. There is a crucial gender gap in security policy formation and security sector reform in most countries where women are seriously under-represented in security decision-making and provision at all levels. There is a clear need to increase the recruitment, training, retention and advancement of women in all security sector institutions, and special attention is required as to how to attract greater numbers of female candidates. United Nations Security Council Resolution (UNSCR) 1325 reaffirms the important role of women in the prevention and resolution of conflicts and in peace-building. It emphasises the importance of the equal participation of women and their full involvement in all efforts to promote peace and security. It also highlights the need to increase women’s role in decision-making, and countries are encouraged to develop National Action Plans (NAP). There is always a danger that lip service is paid to the greater involvement of women in the transforming of national security infrastructures. In addition, the SADC (Southern Africa Development Community) Gender Protocol has a target for women to hold 50% of decision-making positions in the public and private sectors. Most countries in the SADC region are far short of that target in the area of peace and security.Currently, women make up 10 percent of the police UN peacekeeping forces, and just 3 percent of the military UN peacekeeping forces. 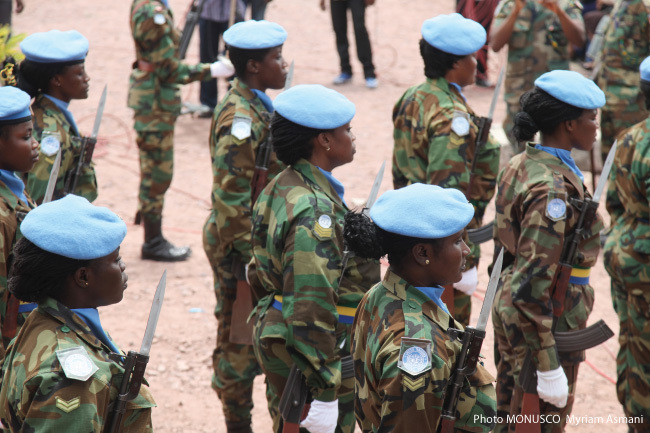 Although the UN is committed to increasing the percentages of women at all levels within its peacekeeping forces, it has a very long way to go and is constrained by the nation states themselves who provide the personnel. Percentage of women in security and defence forces, including military and police, to reach 30 percent by 2030. Will the global community recognise it has missed the opportunity to place a greater focus on increasing the participation of women in security sector institutions? See SADC Gender Protocol 2013 Barometer, page 253. Professor Cheryl Hendricks leads the SADC Gender Protocol Alliance’s Gender Peace and Security Cluster. The UN had set a target of 20 percent deployment of women police peacekeepers by 2014 and 10 percent for troops.